As the light streamed in through the skylight and gave way to the majesty inside, my jaw hit the floor. As I stood transfixed in the atrium, my eyes could not settle, instantly darting from one piece to the next, only stopping to rest at the center of the floor. I was straddled in the limbo between the subversive and the sublime, the whimsical and the morbid, and frankly, I never wanted to leave. 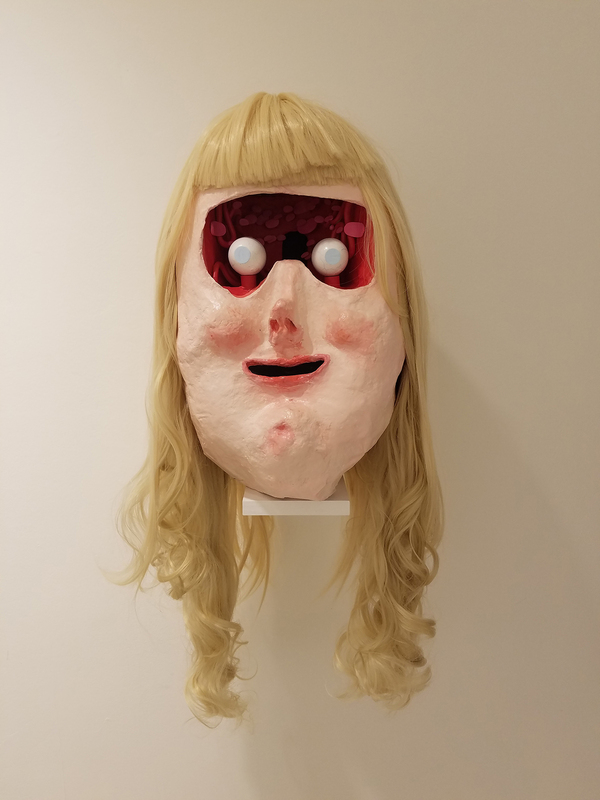 Caitlin and Nicole Duennebier have achieved something truly special on the 4th floor of Simmons University’s Main Building in the Trustman Art Gallery, where Love Superior, a Death Supreme is on display. This show is a collaboration between the two sisters, whose works are complementary while also feeling at odds. 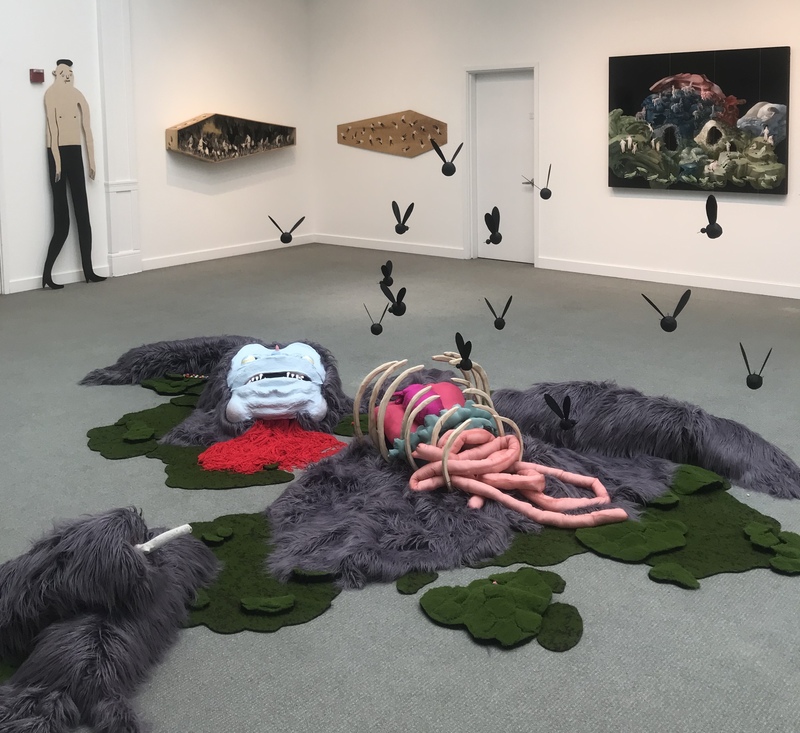 The competing styles are brought together in a variety of mediums—paintings on canvas, sculptures, and even textile and fabric works—each providing insight into two captivatingly dark imaginations. 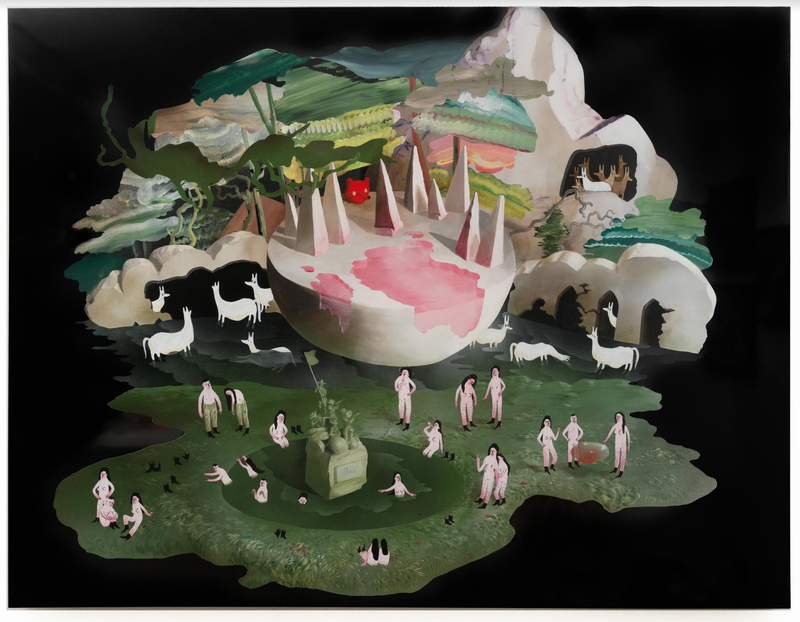 Caitlin’s work can be described as stylized, lowbrow, humorous, and tangible. With an emphasis on craft as well as character, the work would have been at home on the pages of Juxtapose; however, her characters would probably scoff at the publication and walk right off the cover (arms crossed, of course). I kept pondering the characters in her works even after I departed the gallery. The faces of ambivalence, tiredness, suspicion, guilt, and sadness alluded to a greater narrative that need not be explained. Caitlin’s work spoke of a world full of rich, complex characters that seemed more closely relatable than other, the usual expected stylized characters (see: your favorite illustrators’ Instagram). By departing from the Aw Shucks, all smiles illustrations and cartoons one is traditionally accustomed to, the figures take on a graver, darker complexity that indicates a grand story while also providing each character with individual autonomy. Nicole, a more traditional artist (traditional in medium, but by no means in subject matter) deploys thick acrylic paints and classical techniques to create subversive still-lifes and landscapes. With renderings so meticulous they suspend belief, one cannot help but be drawn to the polyps and fungi that invade extremely vermiculite canvases. A pile of meat is transformed and brought to life in the style of a 17th-century master, while a tumultuous seaside fire defers to a mysterious threshold into the briny depths; her work is technical, whimsical and incredibly dark. As I looked deeply at her pieces, I felt a great deal of dread. I was not late for anything, nor was I sick; I was just moved so deeply that I actually felt it in the pit of my stomach. There was something almost guttural to the style of blending and the odd naturalistic palettes that Nicole favors; Good art should make you feel, even if that feeling is nausea. The interplay between the two sister’s styles is particularly strong within their collaborations. With Nicole providing the mystical, otherworldly landscapes and Caitlin’s characters invading the works with both levity and also morbid curiosity; The viewer is left wandering around the funky world of Love Superior, a Death Supreme taking in moody landscapes and dark shapes which are then manipulated by Caitlin’s robust characters inhabiting these alien vignettes—drinking, smoking cigs, laughing, and crying all over their bizarre terrain. The stark contrast creates a strong connection to the worlds that each artist creates, exemplifying what can be possible when their two styles collide. Now, this is a bit of departure from my usual review, where I usually go through and break each work down one by one. However, this is a show that you truly must see to believe. The heads erected on the far left wall are breathtaking, with almost gross attention to detail. Large and moribund, they evoke both Aaahh! Real Monsters and all the girls that bullied you in high school (TERF bangs et al). There are huge woodcut figures created by Caitlin that tower over you with both melancholy and ambivalence, and an installation so large, furry and ambitious it was near-impossible to get one photo capturing it all. If you’ve ever thought that Swampy was too boring, that Swoon was too realistic, and that Kilu Wong needed more fungus and aliens, then I implore you to check this out. 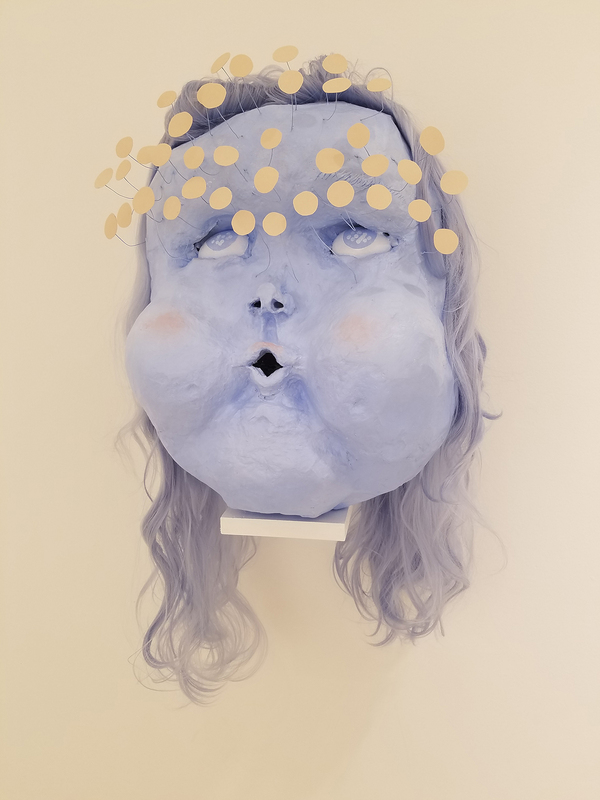 If you just want to be transported to a world of competing styles, gloomy still lives, and puppet murder, then make your way to the Trustman Art Gallery to see Love Superior, a Death Supreme before it closes March 18th.